The EU-Canada Comprehensive Economic and Trade Agreement (CETA) was negotiated between 2009 and 2014, signed in 2016 and due for ratification imminently. Although it is an EU trade deal, CETA could still affect us in the UK after Brexit. As CETA is likely to come into force before we leave the EU, the UK could be subject to some of its provisions for a further 20 years (see below). There have also been indications from the UK government that, post-Brexit, they will use CETA as a template for the new deals they will need to negotiate. Whatever the outcome of Brexit, CETA could be of real importance in deciding the future of UK trading relationships. According to the EU, “CETA will create jobs and growth – and new opportunities for your business,”. However the EU has given little detail regarding how it expects the deal to lead to job creation. The terms of the deal instead cover issues such as removing so-called ‘barriers to trade’ – these tend to be regulations, many of which we value for protecting our rights and environment. The assumption is that the removal of these ‘barriers’ leads to increased trade and that therefore leads to increased jobs. However it is not clear that the proposed changes will be of benefit to ordinary people in the EU. 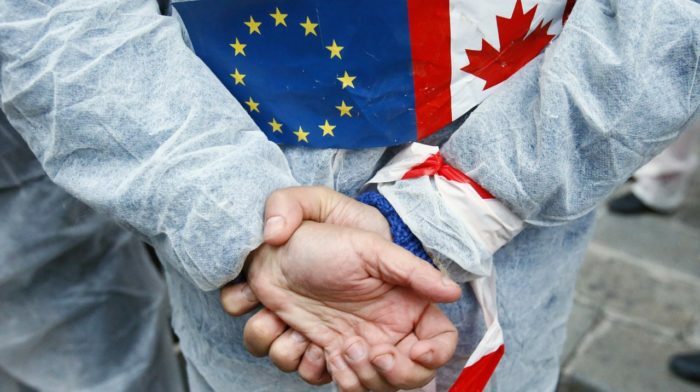 In common with many proposed modern trade deals, CETA threatens to undermine basic democratic processes by locking in privatisation and making it difficult for governments to regulate in the public interest. For example, there is a significant risk that food standards could be lowered and family farming undermined. The inclusion of an Investor-State Dispute Resolution mechanism is particularly problematic as it allows companies to sue governments for changes in policy or implementation that negatively impact the profitability of their investment. This can create a major barrier to the introduction of new legislation across a wide spectrum of issues, from health to the environment. One of the most controversial aspects of CETA is its inclusion of an Investor-State Dispute Settlement (ISDS) mechanism. This mechanism offers corporations significant rights, including to sue governments in private international tribunals if they feel that a policy or its implementation has negatively impacted the profitability of their investment. ISDS has been used to challenge many kinds of regulation, including the introduction of plain cigarette packaging, controls to keep water tariffs affordable, and increases in the minimum wage. Only international investors can make use of these courts – there is no equivalent mechanism for domestic companies, governments or citizens. ISDS effectively operates as a transfer of business risk away from companies and onto the public, there is also growing evidence that the sheer cost of ISDS cases can prevent governments from taking legitimate public policy decisions. A report commissioned by the UK government on the impact of TTIP concluded that the inclusion of ISDS would have ‘few or no benefits’ and may result in ‘meaningful economic costs in the UK’. In response to citizen pressure, some amendments have been made to the plans for CETA’s ISDS mechanism. Rather than allowing companies and states to select their own arbitration judges, they will now be selected from a sitting panel of fifteen pre-approved lawyers. The process will be ‘fully transparent’ in open courts with case documents to be published, and there will be a second-tier appeals process available. However, none of these amendments address the key issues with ISDS raised above regarding the creation of a parallel judicial system exclusively for the use of corporations or the transfer of business risk onto the public. This means that even if the UK withdraws from CETA, the provisions of the investment chapter could continue to apply for a further 20 years. This includes the comprehensive protections offered to investors, including the right to sue governments at private international tribunals. However chapter eight contains a number of other provisions that could also continue to apply. For example, it states that governments cannot limit the size of companies, or the number of companies involved in any economic activity, even if done for reasons of economic need. They also cannot limit which kinds of companies can undertake particular activities, for instance they cannot say that only not-for-profit enterprises can take part in healthcare. Article 8.5 bans domestic content requirements, so governments cannot direct international investment to benefit local communities, for example by requiring investors to make use of local suppliers. Article 8.5 prevents governments from applying import-export ratios, a tool which might be needed to help resolve balance of payments issues. Finally, article 8.13 bans governments from limiting transfers of money and profits, which may make future attempts to limit the use of tax havens more difficult. Whatever happens with Brexit, once CETA is in place the UK could be bound by all of these clauses until as late as 2039. If they are breached, the UK government risks multi-million pound lawsuits that would drain already stretched public funds. CETA threatens to lock-in the privatisation of services. Services are currently included in a large number of trade deals but countries can choose to exclude certain sectors. The European Commission has excluded “audio-visual and other cultural services” as well as “services supplied in the exercise of governmental authority” from CETA. However the definition of the latter phrase in fact means that only services that are not supplied on a commercial basis nor in competition with one or more service suppliers are excluded: anything that has already been (partially) privatised must be included. The majority of trade agreements use a ‘positive list’ approach for deciding which services are covered; this means that only those services that are listed in the deal are liberalised. CETA is the first EU trade agreement to use a ‘negative list’ approach, which means that all services are included unless a country has explicitly listed it as excluded. The problem with this approach is that it leads to the creeping liberalisation of public services as negotiators fail to include sufficiently watertight exclusions and cannot predict what new services might be created in future. Furthermore, CETA contains what is known as a ‘ratchet clause’, which means that even when a reservation is included in a treaty for a particular service, if a country then decides to liberalise the market for this service they are then obliged to maintain that level of market liberalisation and cannot reverse it. This would make it difficult for progressive UK governments to reverse any privatisation measures that previous governments had put in place. Elsewhere in CETA, ‘non-discrimination’ provisions such as clause 19.4 make it difficult for governments to choose a publicly-owned operator when deciding who should run a service, as public bodies are treated as an enterprises like any other, and therefore choosing them because of their ownership status may count as ‘discrimination’. It is not obvious how ordinary citizens in the UK would benefit from this liberalisation in services. Liberalisation does not always make public services cheaper, and can lead to job losses or lower wages for workers. The EU proudly notes that, “The outcome for the EU in terms of access to the Canadian market is very significant [...] Canada agreed to new liberalisation in some key sectors such as postal services, telecoms and maritime transport.” As few UK workers would expect to deliver mail or lay telephone lines in Canada, the primary beneficiaries of this will be large European companies and their shareholders who will bid for the contracts to run these services. The CETA document and the EU’s statements about it repeatedly stress that the deal will not limit governments’ right to regulate. However there are significant concerns that the ‘regulatory co-operation’ provisions in CETA will lead to compromises on standards. Much of the Regulatory Co-operation chapter is concerned with information-sharing about regulation and other activities that appear relatively benign. Whilst much of the language used is ‘soft’, for example emphasising that regulatory co-operation will be voluntary, CETA contains a number of provisions that have the opposite intent. For example, on plant and animal health regulations, Article 5.6 requires that the other country’s inspection standards be accepted if they can ‘objectively’ demonstrate that they are just as stringent. A whole Annex is devoted to describing how this objective judgement will be made, and it is clear that countries will be under pressure to accept standards as being equivalent. Food and farming are areas of particular concern, as regulations in respect of food quality, genetically-modified organisms, pesticides, hormones and animal welfare differ significantly between the EU and Canada. For example, Canadian animal welfare standards are entirely voluntary, and neonicotinoid pesticides, which are linked to huge declines in bee populations, are still in use there. Lower standards can bring down costs of production; if these standards are recognised as equivalent, European farmers could struggle to compete with Canadian imports. This may mean farmers are forced out of business, and is likely to generate pressure on the government to lower standards. In respect of labour rights, CETA contains a chapter that states, “The Parties recognise that it is inappropriate to encourage trade or investment by weakening or reducing the levels of protection afforded in their labour law and standards.” However, this section of the treaty is comparatively brief, does not appear to introduce any new obligations on parties to improve wage or labour standards, and unlike the other chapters of these treaties, the trade and labour sections lack effective enforcement mechanisms, so if the rights set out are broken by one of the parties the other party cannot impose financial or trade sanctions as a penalty. This is in stark contrast with the binding and enforceable provisions in respect of investor protection. On the environment, CETA again stresses the rights of governments to regulate. However it contributes nothing substantive to international co-operation on environmental matters. Worse than this, it could restrict the kinds of environment-focused actions available to governments. For example CETA bans local content requirements, yet these can be key to government strategies for supporting the development of renewable energy sectors. The Canadian government has already fallen foul of trade rules that prevent these kinds of supports: Quebec was forced to revoke feed-in tariffs following a challenge at the WTO. CETA’s ISDS provisions are also likely to hamper progress in achieving climate goals: the energy sector is the single largest destination for foreign direct investment and also the largest source of ISDS cases, including many that challenge government measures to phase out of the use of fossil fuels. As times change and new technologies develop, governments often need to create new kinds of regulation to protect the public interest. The limitations on governments’ ability to regulate which are imposed by CETA, as well as the ISDS option for enforcing them, will make it much more difficult for European countries and Canada to protect our health, environment and rights in the future. TJM is calling for the UK to oppose the ratification of CETA for the reasons outlined above. It also seems highly inadvisable for the UK to sign a treaty to which it will cease to be a party once it leaves the EU but which nevertheless appears to impose ongoing obligations. Given that CETA contains many provisions that risk harm to UK budgets and citizens, it should not be used as a model for future trade agreements that the UK may conclude after leaving the EU. TJM is calling on politicians to make use of alternative models for trade, which put human rights, the environment and the UK’s international commitments before trade. This note summarises the key elements of the Comprehensive Economic and Trade Agreement between the EU and Canada (CETA).